If you’re on the hunt for a great deal on a multi-use pressure cooker from the world’s most popular brand, we have good news and bad news. The bad news is that Amazon’s sale on the supersized version of the Instant Pot Duo is over. 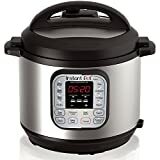 But the good news is that the site’s sale on the even more popular Instant Pot DUO60 6 Qt 7-in-1 Multi-Use Programmable Pressure Cooker is still going strong. In fact, this 6-quart model is on sale right now for the same price as the 3-quart model that’s half the size!